Preheat the oven to 350°F. Line a baking dish with parchment paper or aluminum foil. Mix the oats, Honey Nut Cheerios™, walnuts, peanuts, almonds, shredded coconut, sesame seeds and ground cinnamon in a large bowl. In a separate bowl, combine the honey with the canola oil. Pour this mixture on to the oats and cereal. Stir well to cover everything in the honey and oil. Spread the granola on the baking dish. Bake at 350°F for 35 to 40 minutes, stir with a spatula every 15 minutes. Remove from the oven and immediately add the dried cranberries. Let cool completely. Enjoy! You can use your favorite cereal in place of the Honey Nut Cheerios™. 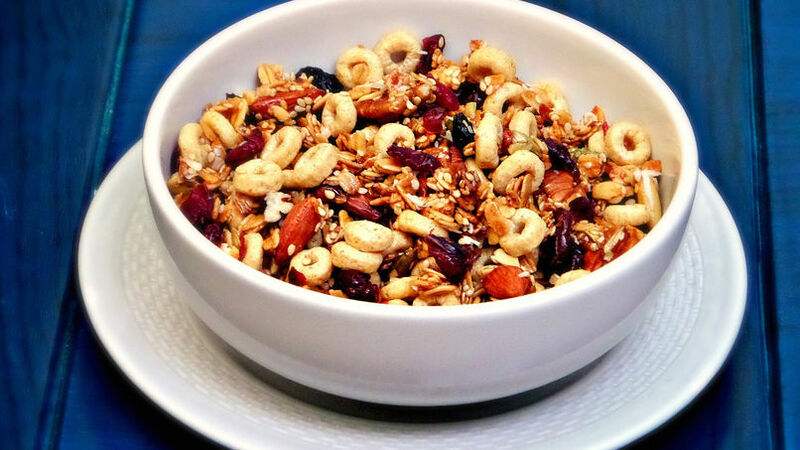 Delight your Thanksgiving and Christmas guests with this irresistible granola made with oats, cranberries, honey, cinnamon and Honey Nut Cheerios™. I love them because they can be served as a snack before dinner or for breakfast with your favorite yogurt. Best of all, you won’t believe how easy they are to prepare with ingredients you probably already have!